The Radio Caroline North Photo Book is a superb ‘5oth Anniversary Edition’ souvenir account of the story of Radio Caroline,broadcasting from the MV Fredericia off the coast of Felixstowe in Suffolk on Easter Sunday 1964, this A4 Landscape size, 84 page photo book tells the story of the station using a fabulous selection of black & white and colour photographs printed on high quality gloss paper. Many have never been seen before - together with items of original Radio Caroline memorabilia. This photo book follows the complete story of the radio station from the initial fitting out of the ex-passenger ferry in Greenore in Ireland to the time spent off the coast of The Isle of Man. The book is lavishly illustrated with over 170 photographs and memorabilia. Many have been rescanned from the original negatives and transparencies using a high resolution scanner and digitally restored to bring out every detail. 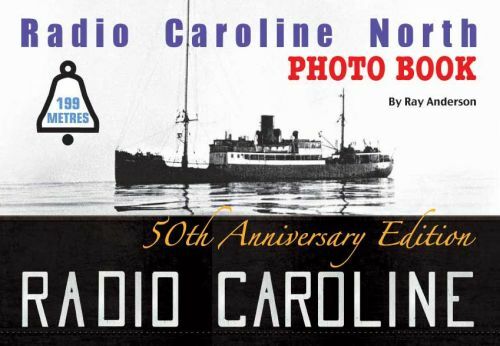 This photo book is a must for any Radio Caroline fan and covers the story up until March 1968, when the radio station was towed away to Holland. Also included are the events by the British government to get the station off the air, and the efforts made by the Isle of Man’s Tynwald government to delay the enforcement of the law. Plus the most comprehensive list of on-air personalities, DJs and newsreaders ever put together. Many detailed photographs of the ship are included together with photographs of the studios and DJs and personalities behind the scenes. Ray Anderson has painstakingly researched and produced this photo book which is the first in a new series celebrating ‘The Golden Age of Radio’ to celebrate the 50th anniversary of these great stations.